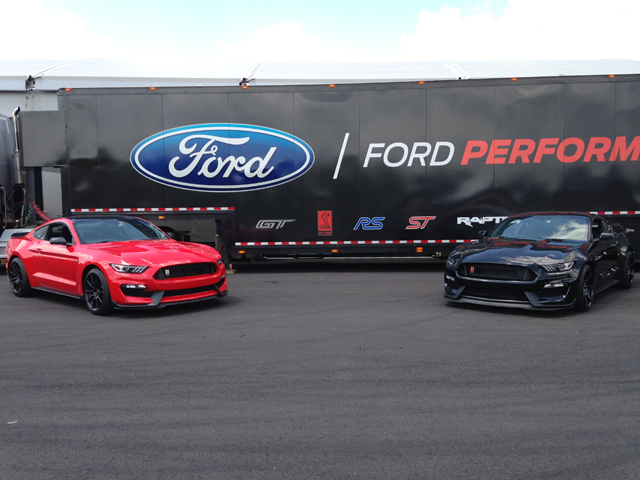 Ford recently invited us to participate in the 2016 Shelby GT350 North American Track Tour. The tour allowed us to get up close and personal with the new GT350 and then take the car for a few laps around the track to see what this beast is capable of doing. Our Thursday morning started early at 8:00 a.m. at Atlanta Motorsports Park in Dawsonville, Georgia. After getting registered for the event, visiting with a few fellow journalists, and woofing down some blueberry muffins and coffee, we were ready to start the day with a brief orientation about today’s activities. After orientation concluded, the tour began with a walk around and demonstration of several of the GT350 and GT350R’s features and capabilities. We were given a detailed show-and-tell of the Track Apps feature. This is a great feature for drivers who like to keep up with their driving stats. Performance data is displayed on a 4.2-inch screen in the instrument cluster. An accelerometer displays key performance data such as lateral and longitudinal g-forces and acceleration. We were also given a thorough rundown of the braking system. The brakes, especially on the front, of the GT350 are massive. 15.5-inch cross-drilled, two-piece brake rotors up front team up with the 14.9-inch rotors in back. Brembo six-piston calipers and Brembo four-piston calipers are attached to both the front and rear brakes respectively. We also got a chance to pop open the hood and get more acquainted with the heart of the GT350. The GT350 is powered by a naturally aspirated 5.2-liter V8 producing 526 horsepower and 429 foot pounds of torque. One thing that makes this engine special is its flat-plane crankshaft. The crank pins are arranged in a single plane which changes the firing order. This engine also doesn’t require counterweights like those used in a cross-plane crankshaft. This helps reduce weight and less effort is needed to spin the crankshaft and, therefore, crankshaft revolutions increase and it revs faster. Our next stop was the Ford Performance Garage. Here, we got to see the pieces and parts that come together to make the GT350 a lethal track machine. Several key components of the car were also laid out on displays for us to examine and see up close. We were amazed to discover that the GT350’s carbon fiber wheels are roughly 18 pounds each. You can literally pick them up easily with one hand! Using carbon fiber helps shave off fifty pounds compared to using aluminum wheels. We also got to view a GT350 turned on its side in order for us to see the many performance features underneath. For instance, the underbody belly pan helps tremendously with front downforce. It’s flat to help create negative pressure in order to help the car stick to the road. Also, we got to see how the front kick-ups help shoot air to keep the front brakes cool and the rear kick-ups help keep the drive shaft and exhaust pipes cool. It’s amazing to see the attention to detail and the amount of thought that went into creating this car. Literally, every inch of this car has been scrutinized in order to maximize performance. Next up was an introduction to the Ford Performance division. We were given a brief history of the Ford Performance division, some background on the SVO days, and told a few stories about Ford’s extensive involvement with Carroll Shelby. We also got to see several new blue ovals from Ford Performance, including the new Focus RS and F-150 Raptor. We were really excited to hear that Ford is planning on unleashing more performance vehicles from the Ford Performance Division very soon. Finally, it was time for us to get ready to hit the track! After getting fitted for our helmet and other safety equipment, we got suited up and strapped into our GT350. We took a few minutes getting acquainted with the controls and getting driving tips from our ride along track expert. Now it was our turn to take the GT350 for a few laps around Atlanta Motorsports Park. We exited pit row and hit the track for an adrenaline rush we won’t soon forget. Our first lap was basically feeling out the car and getting used to the track. After that, we thrashed the car pretty hard as we rounded the curves and accelerated hard through the straightaways. It’s amazing the amount of grip the tires have! Not once did the car fishtail through the hairpin curves. Each time around the track, we got a little braver and faster and pushed the car even harder. The GT350 accelerates like crazy and we found ourselves driving mostly in third gear throughout the drive. After our drive time was over, it was time to switch positions and let our track expert take the wheel. Once he hit the track, we were in for quite an adrenaline rush. He knew the car and track well and showed us how to get the most out of the GT350. To say the GT350 performed flawlessly is an understatement. The car definitely did not disappoint. Our day at the track getting to know the GT350 was quite an experience. This car is truly amazing and we really appreciated the opportunity to drive it like it was meant to be driven. We came away feeling that as great as the car is to drive on the streets, it was clearly made for the track. The amount of detail that went into the GT350 is evident once you’ve had a chance to drive it. Hopefully, we can get another chance to drive one soon.